Pluto is the planet of our solar system. 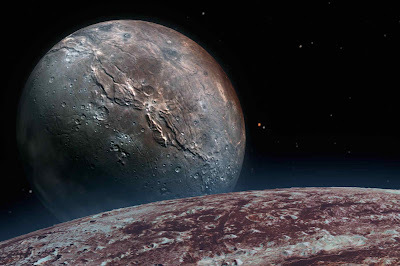 Pluto is not considered in astrology. However, Pluto has taken an important part in astrology. It is known as Yam in astrology. It has mixed effect of Mercury and Shani. It relates with technique, communication and higher spirituality. Pluto has all technique of world. Mysterious rays relates with Pluto. Pluto solves mystery of the life. It gives spiritual and physical success. Sometime, it takes person to the god in small age. Pluto on first place gives courage and will power. However, one might face serious results if they do wrong way. In second house, Pluto creates financial problem. One gets benefit if they get advisor. On third place, Pluto makes person unstable. A person cannot work on same way. On fourth house, Pluto makes person generous and intelligent. They cannot accept any recognition. On fifth house, Pluto inspire to follow wrong way. Sometime, life becomes machine. On sixth house, Pluto gives good capability to solve any problem. But they should take care in infection problem. On seventh house, Pluto makes person uncontrollable. Person misuses his power. On eighth house, Pluto gives spiritual and mysterious power. But they remain alone in physical life. On ninth house, Pluto gives person special spirituality. Sometime, person get ego. On tenth house, Pluto creates struggle in life. One gets success after hard work. On eleventh house, Pluto gives good respect and high position. But they get betrayal. On twelfth house, Pluto makes person spiritual. But sometime, they become hypocritical. Remedy: One should arrange light on entrance main door. Also, lighted at entrance main in evening.